The Dharma Kids Practice Group is a program for children ages 6 through 11. Together, we explore the teachings of the Buddha and plant the seeds of compassion, loving kindness, and mindfulness, for the benefit of all. 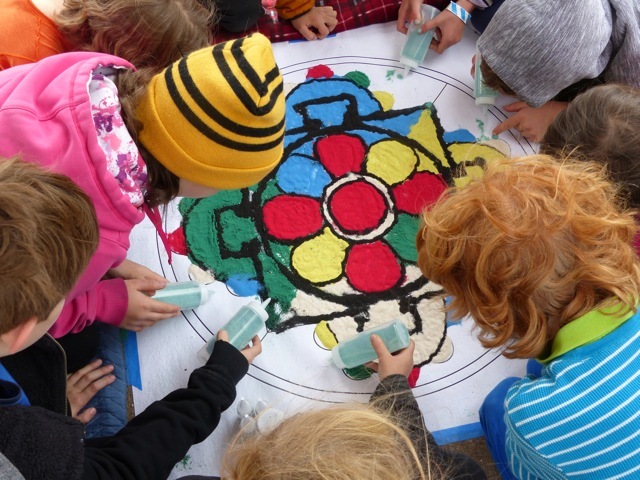 We practice various meditations, engage in dharma discussions and inquiry, play cooperative games, create dharma-inspired art, participate in service projects and cultivate friendships. Lama Pema or Lama Yeshe offers a brief dharma talk at the beginning of each session. Our practice group is under the direction of Lama Pema Clarke, and is led by practice group leaders and parent volunteers. We meet in the KSC library two times a month, October through May, from 9 am -11:30 am on KSC’s Calm Abiding and Tonglen Sundays. Group members commit to regular attendance in order to build a cohesive Dharma Kids community, and support a reliable family practice. We ask that parents be present at the Dharma Center (that is, upstairs in the Shrine Room) for their children to participate. If you have been contacted by a Dharma Kids group leader, and know that your child has been added to the current roster, please fill out our Dharma Kids Registration Form >>> Registration is required. The foundational perspective of Tonglen practice is to consider all beings as our kin, because we and all beings share the wish to be happy and avoid suffering. From that common perspective, we aspire to utilize our natural great heart of compassion to relieve beings of suffering and bring them genuine happiness. This recorded version of the Tonglen practice has been adapted for children, and was generously voiced/recorded by former Dharma Kid parent, Cat Gould. This meditation is common to many traditions of Buddhism. In this practice, we rest our attention on a simple meditative support, such as the breath. Instead of following thoughts and emotions as we usually do, we release them and maintain our connection to the support. This beautiful video by Julie Bayer Salzman & Josh Salzman, illustrates the benefits of calm abiding from a child's point of view. We incorporate this video into our Dharma Kids curriculum, and show it in tandem with our Mind in a Jar project.